EFFORTS of environmentalists to block a vast waterways scheme linking the Parana and the Paraguay rivers in South America have elicited promises from project officials that a full-scale environmental impact study will be conducted first and the project would be abandoned if its damage potential was rated high. Environmentalists, however, warn that official promises should be treated with scepticism and there should be no relaxation of efforts to halt the Hidrovia, the name given to the proposed 3,400-km waterway involving the governments of Argentina, Bolivia, Brazil, Paraguay and Uruguay, who are jointly seeking international financing for the project. Hidrovia is expected to become the region's biggest development scheme since the construction of the vast Itaipu dam in the 1980s. 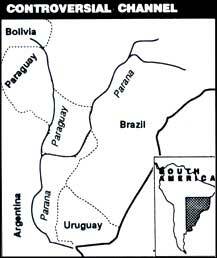 Supporters of Hidrovia say it will provide a quick, cheap and easy link for the impoverished heartland of South America with seaports on the river Plate. They estimate Hidrovia's rate of return at 16-23 per cent. Environmentalists, led by Wetlands for the Americas (WA) and the US-based Woods Hole Research Institute, however, insist Hidrovia's economic viability is overstated and warn it would become a major threat to the 200,000 sq km Pantanal, a vast Brazilian marshland that supports a rich diversity of wildlife and acts as a gigantic sponge that regulates water levels in the Paraguay river. Damaging the sponge, they say, increases the risk "of both catastrophic rises and extreme lows in water level along the middle and lower Parana river". A Wetlands for the Americas study also notes, "It is very likely that the greatest environmental impacts caused by the Hidrovia will be indirect", such as better transport inevitably increasing emigration to the region, spreading water-borne diseases, and increasing soil erosion, river silting and agrochemical residues.